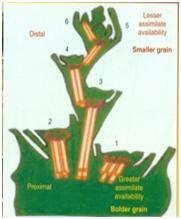 Greater resistance to the flow of assimilates to the distal spikelets as compared to the proximal spikelets identified as major bottleneck in increasing the sink strength of wheat. The sink capacity and thus yield can be increased by increasing spikelet number per ear rather than the grain number per spikelet. The major genes involved in lipid biosynthesis pathway isolated from Brassica juncea with the aim to uncover and understand their role in synthesis and accumulation of fatty acid in tissues with a view to engineer them for improved nutritional quality. Microsomal omega-6 desaturase gene (fad 2-1) isolated and characterized for soy oil quality improvement. 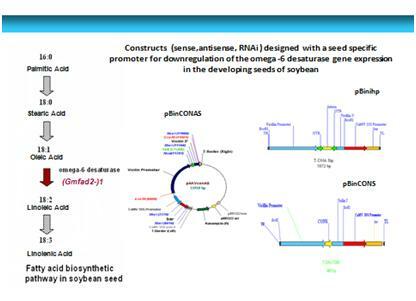 The gene silencing constructs (RNAi sense and antisense) for down regulation of fad2-1 expression in seeds designed for transformation into soybean. 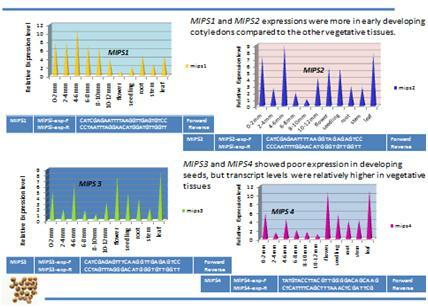 Full length sequences of phytase and myo-inositol phosphate synthase (MIPS) genes involved in phytic acid metabolism isolated and characterized to reduce phytate levels in soybean seeds. Gamma irradiation (0.25 and 0.5 KGy) identified as a strategy to reduce off- flavor in soybeans through enhancement in their antioxidant potential. Grain growth during terminal heat stress in wheat is limited by thermo-sensitive Soluble Starch Synthases (SSS) as compared to other enzymes involved in starch biosynthesis namely ADP-glucose pyrrophosporylase and granule bound starch synthases. Thermotolerance in grain growth can be enhanced through introgression of thermostable form of SSS in high yielding cultivar of wheat. An efficient SOS pathway contributing to detoxification of Na+ ions explained the mechanism of salt tolerance in wheat and mustard. Phenotyping of rice germplasm for high temperature tolerance led to identification of Nerica L-44 as the most heat tolerant genotype in terms of spikelet fertility, grain yield as well as quality of grain. In a study to understand the mechanism and molecular basis of drought-tolerance in rice, five novel transcription factor gene sequences associated with water-deficit stress have been isolated and characterized for defining their role in drought tolerance. 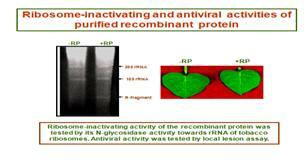 Antiviral proteins (AVPs) isolated, purified and characterized from four non-host plant sources (Chenopodium album, Celosia cristata, Amaranthus tricolor, Bougainvillea x buttiana) that were found to impart resistance (localized, systemic) when applied prior to virus challenge. Genes encoding these AVPs/RIPs also isolated, characterized and subsequently expressed in E.coli. Response of wheat to heat stress studied and various heat-stresses induced and differentially expressed proteins identified and characterized, using immune-blotting & MALDI-TOF, for elucidation of their role in heat-stress tolerance. 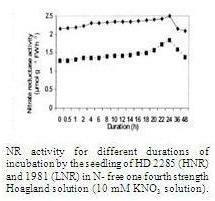 Nitrate absorbed in Low Nitrate Reductase (LNR) wheat genotype is not utilized efficiently by the enzyme nitrate reductase and accumulates in the tissues compared to High Nitrate Reductase (HNR) genotypes. High-affinity nitrate transporter gene specifically expressed in roots of Brassica juncea BjNRT2.1 was cloned which was an orthologue of AtNRT2.1. Shelf -life of tomato increased by 5 - 10 days by treatment with 0.3 ppm (µl/l) of 1-methylcyclopropene (1-MCP) at relatively higher storage temperature (25 – 30oC). Vase life of gladiolus increased by 5- 6 days in a vase solution containing 100 ppm 5-sulphosalicylic acid. An ethylene receptor gene, GgERS1 was isolated from an ethylene-insensitive Gladiolus grandiflora var. Snow Princess. For the functional validation full length GgERS1 gene was cloned and mobilised in tomato plant Pusa Ruby by Agrobacterium mediated genetic transformation. Magnetopriming introduced as novel technique for dry seed priming with static magnetic field that resulted in seed invigoration and improved performance under normal and stressed environment. A new method for reclaiming low vigour aged seeds was developed by exposing naturally aged garden pea seeds to pulsed magnetic field that improved germination and vigour by 8 and 90% respectively in treated seeds compared to untreated aged.